Normal aging causes brain functions to change. Over time, healthy individuals experience the decline of some cognitive ability. Small declines in the area of memory, both visual and verbal, may occur along with some short-term memory loss. The brain, like any muscle, needs exercise to stay in shape. The more exercise the brain gets, the better it is at processing information. Memory exercises for seniors can help short- and long-term recall. Crossword puzzles are one of the most effective memory exercises. Other puzzles are likewise beneficial. The American Health Assistance Foundation's (AHAF) Alzheimer's Disease Research program recommends playing Sudoku to exercise the brain and help memory and cognitive functioning. Soduku is similar to a crossword puzzle, but numbers are used instead of words. The puzzle is a grid of nine squares across and nine squares down. Each row across and down must have only one of each consecutive number through 9. Each block of cells must also only contain one of each number up to 9. Sudoku doesn't require any math skills or calculations. It is a logic puzzle and can become habit-forming. 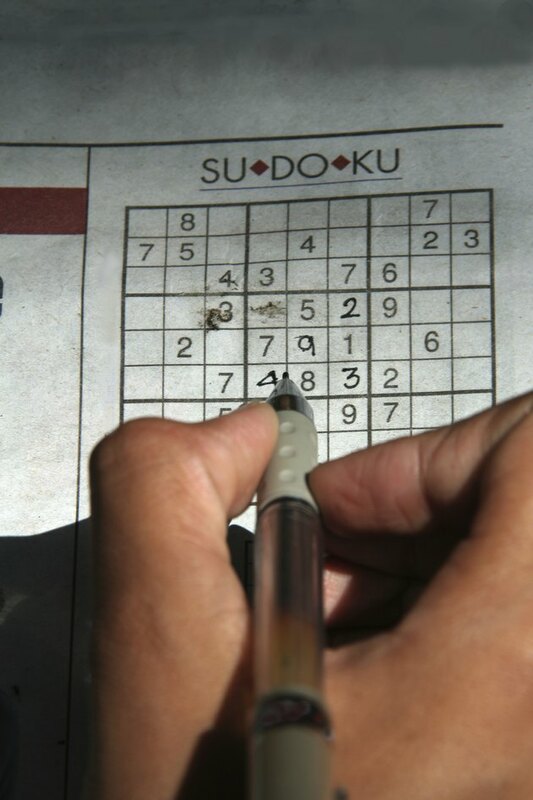 Sudoku puzzles can be found in the newspaper, online or in many puzzle books. One way to stimulate brain function is by sensory data stimulation. Involving all five senses in an experience will stimulate and wake up the brain. Listen to some beautiful music, taste something delicious, look at something amazing, touch something incredibly soft and light a scented candle for a pleasing aroma to smell. Using and paying attention to sensory stimulus will stimulate and heighten sensory memory and awareness. Playing card games regularly such as Poker, Solitaire, Hearts, Rummy and Go Fish exercises the brain and may delay memory loss associated with aging and dementia along with helping to maintain brain vitality, according to the American Academy of Neurology. Chess is a strategy game that can boost memory and cognitive ability. Any game that involves strategy will exercise the brain. The brain needs daily workouts in order to stay fit, according to the University of Michigan. Reading will exercise the brain and help in word recall. Reading the newspaper, books or magazines has been shown to provide a brain boost. In a memory and aging study, Dr. Yonas Geda, a neuropsychiatrist at the Mayo Clinic, found that engaging in cognitive activities such as reading can prevent future memory loss. The 2009 study also found that seniors who play games, work on the computer or participate in crafts such as pottery or quilting had a 30 to 50 percent decrease in memory loss compared with people who did not participate in those activities.